More choose Security+ for DoD 8570 compliance than any other certification. Security+ focuses on the latest trends and techniques in risk management, risk mitigation, threat management, and intrusion detection. CompTIA Security+ is the first security certification IT professionals should earn. It establishes the core knowledge required of any cybersecurity role and provides a springboard to intermediate-level cybersecurity jobs. Security+ incorporates best practices in hands-on trouble-shooting to ensure security professionals have practical security problem-solving skills. Cybersecurity professionals with Security+ know how to address security incidents – not just identify them.Security+ is compliant with ISO 17024 standards and approved by the US DoD to meet directive 8140/8570.01-M requirements. Too slow, this guy does not motivate, if you're able to watch three videos you're able to give yourself a shot. Agree, The pace is too slow and the trainer has no motivation on his body I hope they update the videos "Keith Barker" is much good trainer. They need to replace the instructor. It is discouraging to watch his lecture videos. It may come as a shock to people but Jeffrey is going over material that is in the SY501 book and most likely on the test. Its only 20 hours, whats the rush? I think Jeffery is doing a good job, you guys would complain if he was moving too fast. I think the content is pretty good but the instructor looks very sleepy and unmotivated on most videos. Just starting this module, So far so good. I adjust the speed of each video to 1.5-1.75 x speed and the pace is perfect at that speed. I get that he is basically regurgitating information from a book but man he makes learning this stuff painful. CompTIA Cybersecurity Analyst (CySA+) is an IT workforce certification that applies behavioral analytics to networks and devices to prevent, detect and combat cybersecurity threats. CySA+ is the only intermediate high-stakes cybersecurity analyst certification with performance-based questions covering security analytics, intrusion detection and response. The CompTIA CySA (Cybersecurity Analyst) certification prep course is designed to help prepare candidates to sit for the CySA+ exam, as well as reinforce concepts for work roles such as Systems Security Analyst, Threat Analyst, and Vulnerability Assessment Analysts. Respond to cyber incidents with a forensics toolkit, maintain the chain of custody, and analyze incident severity. If you're looking to get certified, this course will also help prepare you for the CompTIA CSA+ Certification (CS0-001) exam. The first goal of the course is to make you an outstanding cyber security analyst and in the process, make sure you are ready to pass the CompTIA exam. Primary audience: Anyone preparing for the CompTIA Cybersecurity Analyst CySA+ examination. The CompTIA Cybersecurity Analyst (CySA+) examination is designed for IT security analysts, vulnerability analysts, or threat intelligence analysts. The exam will certify that the successful candidate has the knowledge and skills required to configure and use threat detection tools, perform data analysis, and interpret the results to identify vulnerabilities, threats, and risks to an organization with the end goal of securing and protecting applications and systems within an organization. No reviews for this course ! CompTIA Advanced Security Practitioner (CASP+) is the ideal certification for technical professionals who wish to remain immersed in technology as opposed to strictly managing resources. CASP+ is the only hands-on, performance-based certification for practitioners - not managers - at the advanced skill level of cybersecurity. While cybersecurity managers help identify what cybersecurity policies and frameworks could be implemented, CASP-certified professionals figure out how to implement solutions within those policies and frameworks. CompTIA Advanced Security Practitioner (CASP+) is the ideal certification for technical professionals who wish to remain immersed in technology as opposed to strictly managing resources. CASP+ is the only hands-on, performance-based certification for practitioners - not managers - at the advanced skill level of cybersecurity. While cybersecurity managers help identify what cybersecurity policies and frameworks could be implemented, CASP-certified professionals figure out how to implement solutions within those policies and frameworks. The CASP+ certification validates advanced-level competency in risk management; enterprise security operations and architecture; research and collaboration; and integration of enterprise security. Successful candidates will have the knowledge required to: Enterprise Security domain expanded to include operations and architecture concepts, techniques, and requirementsMore emphasis on analyzing risk through interpreting trend data and anticipating cyber defense needs to meet business goalsExpanding security control topics to include Mobile and small form factor devices, as well as software vulnerabilityBroader coverage of integrating cloud and virtualization technologies into a secure enterprise architectureInclusion of implementing cryptographic techniques, such as Blockchain- Cryptocurrency and Mobile device encryption CASP+ is compliant with ISO 17024 standards and approved by the US DoD to meet directive 8140/8570.01-M requirements. Regulators and government rely on ANSI accreditation because it provides confidence and trust in the outputs of an accredited program. Over 1.3 million CompTIA ISO/ANSI-accredited exams have been delivered since January 1, 2011. Implement security controls for mobile devices. Implement security in the systems and software development lifecycle. Respond to and recover from security incidents. Knowledge of computer networking concepts and implementations, such as the TCP/IP model and configuration of routers and switches. Knowledge of cryptographic concepts and common implementations, such as Secure Sockets Layer/Transport Layer Security (SSL/TLS) and public key infrastructure (PKI). Knowledge of identity and access management (IAM) concepts and common implementations, such as authentication factors and directory services. Knowledge of common security technologies used to safeguard the enterprise, such as anti-malware solutions, firewalls, and VPNs. This course is designed for IT professionals who want to acquire the technical knowledge and skills needed to conceptualize, engineer, integrate, and implement secure solutions across complex enterprise environments. The target student should aspire to apply critical thinking and judgment across a broad spectrum of security disciplines to propose and implement sustainable security solutions that map to organizational strategies; translate business needs into security requirements; analyze risk impact; and respond to security incidents. This course is also designed for students who are seeking the CompTIA Advanced Security Practitioner (CASP+) certification and who want to prepare for Exam CAS-003. Students seeking CASP+ certification should have at least 10 years of experience in IT management, with at least 5 years of hands-on technical security experience. CompTIA PenTest+ is for cybersecurity professionals tasked with penetration testing and vulnerability management. 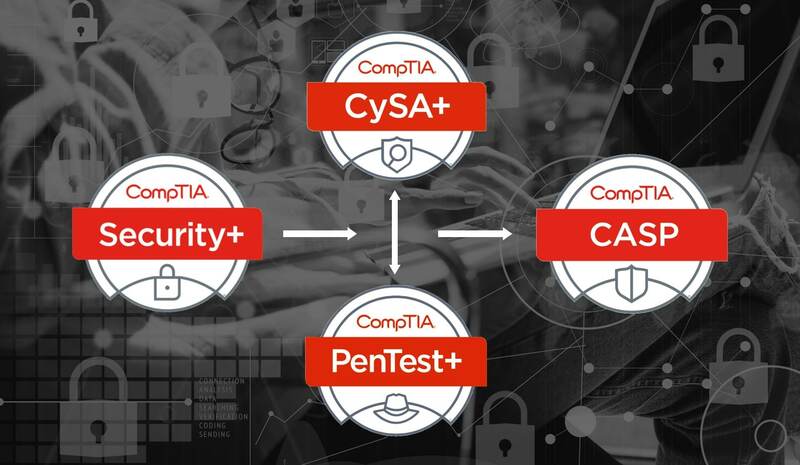 CompTIA PenTest+ is the only penetration testing exam taken at a Pearson VUE testing center with both hands-on, performance-based questions and multiple-choice, to ensure each candidate possesses the skills, knowledge, and ability to perform tasks on systems. CompTIA PenTest+ is for cybersecurity professionals tasked with penetration testing and vulnerability management. CompTIA PenTest+ is the only penetration testing exam taken at a Pearson VUE testing center with both hands-on, performance-based questions and multiple-choice, to ensure each candidate possesses the skills, knowledge, and ability to perform tasks on systems. PenTest+ exam also includes management skills used to plan, scope, and manage weaknesses, not just exploit them. PenTest+ is unique because our certification requires a candidate to demonstrate the hands-on ability and knowledge to test devices in new environments such as the cloud and mobile, in addition to traditional desktops and servers. CompTIA PenTest+ assesses the most up-to-date penetration testing, and vulnerability assessment and management skills necessary to determine the resiliency of the network against attacks.Successful candidates will have the intermediate skills required to customize assessment frameworks to effectively collaborate on and report findings.Candidates will also have the best practices to communicate recommended strategies to improve the overall state of IT security. CompTIA PenTest+ meets the ISO 17024 standard. Regulators and government rely on ANSI accreditation because it provides confidence and trust in the outputs of an accredited program. Over 1.3 million CompTIA ISO/ANSI-accredited exams have been delivered since January 1, 2011.